Quake Live is adding new maps and features, but if you want access to them, you're going to have to spend a few bucks each month. Almost exactly a year after it was announced that Quake Live would be adding a pay-to-use option, id software has unveiled two new subscriptions for the browser-based shooter, called simply "Premium" and "Pro." 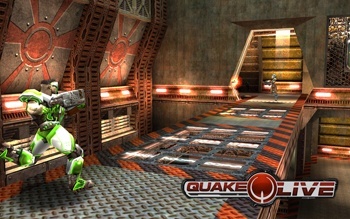 The Premium membership gives access to 20 exclusive maps, said to be fan-favorites from previous Quake games, a new "Freeze Tag" game mode, and exclusive "premium level" awards. It also grants the ability to create a clan and join up to five others. The Pro subscription has the same benefits as the Premium level, but also lets players set up their own servers, invite up to three friends with standard accounts to play on premium maps, and doubles the number of clans players can join. The Premium and Pro subscriptions cost $1.99 and $3.99 a month respectively, and are billed annually. For those who don't want to shell out, there will also be the "Standard" subscription, which is essentially the game as it is right now, and is free, but limits players to just one clan and obviously doesn't have any of the premium content. Whether the subscription model will be successful remains to be seen however, and will largely depend on how much people want the additional content and features. For many, the free option will be more than sufficient, and although id's John Carmack has said in the past that there were no plans to shut the service down, he also said that it wasn't sustainable on ad revenues alone.